Submitted by ripley on Wed, 2007-05-16 20:57. I am new to Circa (and to DIY Planner-- great site!). My Circa compact notebook arrived today. When I ordered it, I had a hard time deciding between it and the junior size. I plan to use it for meeting and book notes. Would someone who is familiar with one or both of these sizes comment on the size for taking notes. I'm wondering if I should exchange the compact for the junior. At the same time, I appreciate things in relatively smaller sizes to reduce the bulk of all the stuff I tend to carry in my bag. Submitted by altcountryman on Thu, 2007-05-17 15:48. 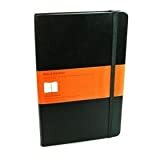 I don't have experience with the Compact, but I've been using a Junior for a week or so now, and I don't think, personally, I'd want anything smaller for doing much notetaking. Full disclosure: I have been guilty of taking lots of notes, but then doing nothing with them, so I'm trying to take "smarter" notes and really getting something out of them. The Circa paper in the Cornell-esque style (or, of course, its DIY counterpart) is helpful in this quest because I can put the metadata in the left-hand margin. But, back to the size of the notebooks (and your question - I think Junior is a nice balance between portability and capacity, Compact looks ultra-portable, but IMHO compromises a lot of writing space to get there. If your intent is a lot of note taking, I'd be wary. To compare Circas to laptops, I think a letter-size is a 17" MacBook Pro, a Junior is a 12" Sony VAIO, and Compact is a UMPC. Submitted by ripley on Thu, 2007-05-17 17:03. Nice comparison to laptops. I have a 12" Powerbook, and feel it hits the sweet spot. You know, with your comment and the nagging question about suitability, the only thing for me to do is exchange the compact for a junior. Oh, but I will hate the wait for the new notebook to arrive! Perhaps I'll just order it and return the compact to get the ball rolling today, rather than an official exchange. Submitted by supenguin on Thu, 2007-05-17 19:13. Depending on how you're going to use your notebook(s) you may want to consider keeping the compact, ordering the Junior size and using both. I find the Junior size is the perfect combination of enough space to give me room to write and portability. If you want something small you can stuff in your bag, the Compact may be good. Just use it to capture information and then transfer the important pages to your Junior size notebook when you get back to your desk. Submitted by ripley on Thu, 2007-05-17 20:51. Nice idea, Kenny. My problem (at the moment) is that I've spent a small fortune reorganizing/refurnishing my home office. Then, I caught the hipster PDA bug, which led to the Circa bug (that wasn't hard as I love Levenger!). So, I feel I must exercise some restraint and just get one notebook. (I guess I could get the compact starter kit). Thanks for your input. I'll keep it in mind. Submitted by Sara on Thu, 2007-05-17 20:55. What about cutting down some paper from your computer printer and test how the size feels for your method of notetaking, etc. Submitted by ripley on Fri, 2007-05-18 17:22. No, actually, I drew the page dimensions of each on a letter-size sheet of paper. However, I didn't use it to take notes. That's a good idea. Thanks for your suggestion. I have decided to go with the junior; sent the compact stuff back this morning. Submitted by Sara on Fri, 2007-05-18 17:33. Submitted by ripley on Tue, 2007-05-29 16:24. Well, my junior Bomber foldover notebook arrived, along with the junior Ciramagine that I snagged on clearance. I have used the Circamagine for some daily notetaking for about a week and I'm glad I switched to the junior size. It does seems to strike just the right balance between portability and space for notes. Thanks to all who offered their opinions.